Stout in the cake and stout in the ganache! This double stout chocolate bundt cake is studded with slivered dark chocolate for even more intense flavor. It’s every chocoholic’s heaven! I wanna go back in time… to late November of 2015… Just a few months back… Is it too much to ask? I wanna go back to indulge in this rich double stout chocolate bundt cake once again. It’s not that I don’t want to bake this cake again. No, no, I would do it in a heartbeat. It’s just not feasible at this time while caring for a newborn, you know. I made this cake back when I was 8 months pregnant. Normally, I’d sip on a bottle of Guinness while baking with it. But as you can imagine I couldn’t really do that, could I? While staring at the leftover stout on the counter, I decided to pour some into my ganache too. Wouldn’t you do the same?? Oh my gosh, so-so-good!! 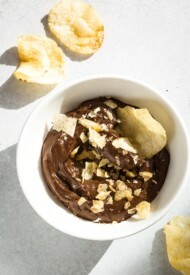 Rich silky chocolate ganache with tang! 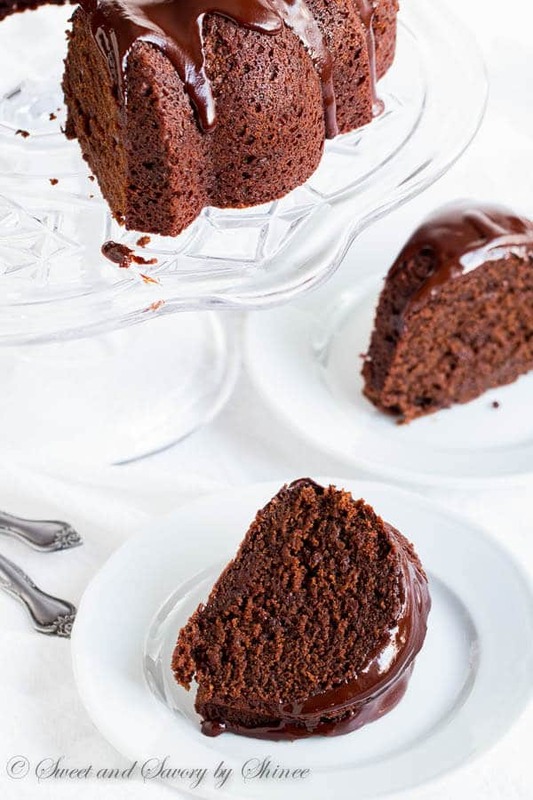 The chocolate cake is rich, moist and oh-so-indulgent too! It’s a must-bake for St. Patrick’s Day. But you should definitely bake it this weekend for a test run. And please send me a slice, would ya? Ok, take a moment and look at that slice. Isn’t it the most delightful thing to look at? 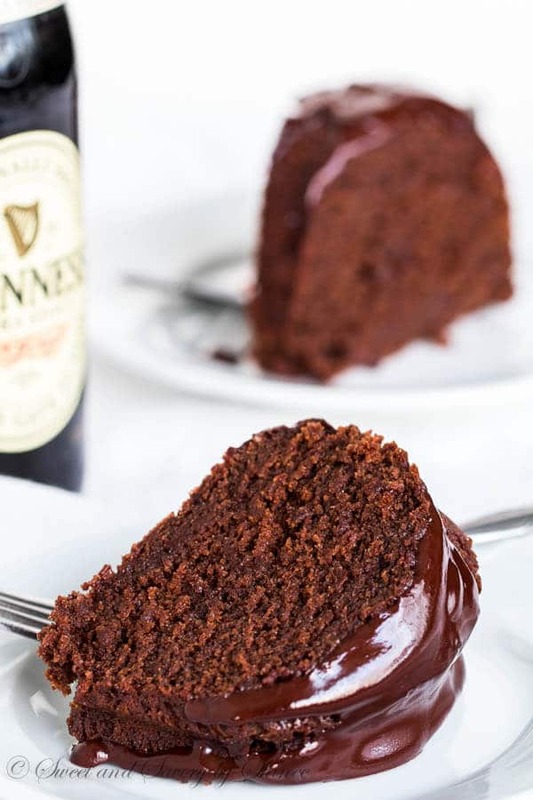 This chocolate bundt cake is quite special because 1) the chocolate flavor is boosted with STOUT, duh! and 2) I stirred in some chopped dark chocolate into the batter for richer and more chocolate-y flavor! It’s practically oozing with chocolate in every bite. Alright, not oozing, but there’s definitely taste of rich chocolate in every bite. Heaven!! ???? And on another bright side, it couldn’t be easier to make this beauty! Simply mix the dry and wet ingredients separately, and then combine the two into a smooth batter. For extra doze of chocolate, stir in slivered chocolate and bake! As for ganache, basically follow the simple ganache recipe, then add a splash of stout to finish off the goodness! Pour that chocolate stout sauce (?) over the cooled cake while it’s still nice and runny. And take your time to adore that stunning presentation. Stout in the cake and stout in the ganache! This double stout chocolate bundt cake is studded with slivered dark chocolate for even more intense flavor. Every chocoholic’s heaven! To make the cake, preheat the oven to 350°F (175°C). 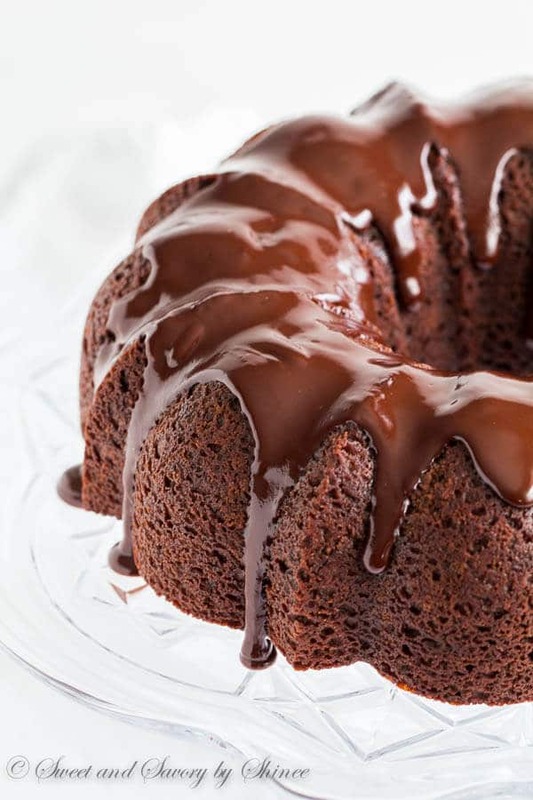 Generously spray 14-cup bundt pan with a cooking spray. 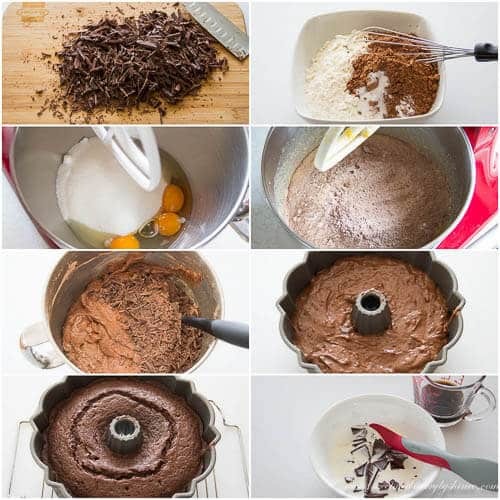 In a medium bowl, whisk together flour, cocoa powder, baking soda and salt. In a large mixing bowl, beat the eggs and sugar on medium high speed for 2 minutes. Add Greek yogurt, stout, butter and vanilla extract and mix until combined. Add the dry ingredients and continue to mix until the batter is smooth, about a minute. Stir in the chopped chocolate. Pour the batter into the prepared pan and bake for 45-50 minutes, or until inserted toothpick comes out clean. Cool the cake completely in the pan on a wire rack, and then invert it onto a serving platter. To make the ganache, chop the chocolate into small pieces. Warm up the heavy cream in a microwave for 30 seconds. Pour it over the chocolate and stir until smooth. Stir in the stout. Pour the ganache over the cake while it’s warm and runny. Store the cake in the fridge for up to 5 days. Hi, this cake looks and sounds absolutely delicious. I plan on making this for my Hubby. I have a question for you though, what is Stout 🤔😁. I have always been told that any baking question is never a stupid question 😄, but really, I’ve never heard of stout !! Thank you in advance for your response. Love your site !! Hi, Esther. Agreed, there is no such thing as stupid question. And thanks for asking. Stout is basically super dark, strong, malty beer, like Guinness Stout. Hope you and your husband will enjoy the cake. Let me know. I AM MAKING THIS! Thanks for sharing each step. This chocolate cake looks divine! I tried stout for the first time a few months ago while traveling through England. Sharing!! Coming to you from Foodie Fridiy! Stunning indeed! I know the newborn phase and I will absolutely make this for you over the weekend and send some to you 😉 No one should be without this beautiful cake!! Pinning! Aww, you’re such a sweetheart, Kathryn! 🙂 Thank you! 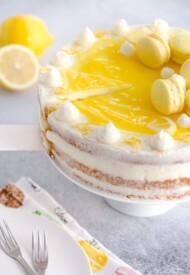 Beautiful and most delicious looking cake! Well I jumped in with both feet, closed my eyes when I added the stout to the ganache and guest what?? ?….it worked perfect and the cake was delicious. Our friends took the rest of the cake home for left overs it was that good. Thank you! I will always trust you completely from now and not be nervous when trying something new. Love the picture of your family!! You have that knack of bringing a new chocolate cake when I need one. I have two friends birthdays and they are coming on Saturday for dinner. The last time I made your Ina Garten cake and it was such a huge success in the neighborhood. I will take your word that the stout tastes good in the ganache but I’m gonna admit I’m a little nervous to try it. 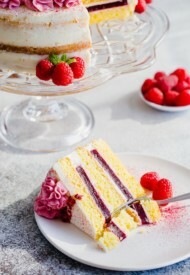 The cake looks beautiful though and I always appreciate your photography and the step-by-step process….thank you. Hi, Janet! So happy you made and loved Ina’s cake. Let me know how you like this one. I know it’s a bit out there to add stout in the ganache, but it’s tiny bit, so it’s not really overpowering. 🙂 Let me know what you think if you give it a try though. Agreed, stout+chocolate=amazing!! Thanks for stopping by, Thalia! I bet, Medha! I get that every time I look at this post. 😉 Thanks for stopping by. This looks delicious! I bet the Guinness gives it a super rich flavor. Pinned!! It definitely does. So good. Thanks, Kathryn!